How can I continue or make the exercises if the http://c9.io. doesn't work, any one can help me? The cloud9 service isn’t working for you? You could either try the AWS Cloud9 service or use Glitch. I think those are just to link back to in order to show your work. You can always set up a local environment with node and express to develop and then push your code to Github as well. The freeCodeCamp community has decided to move away from Cloud9 because it required use of a credit card, and I guess this new thing doesn’t help anymore either. freeCodeCamp will be suggesting that you use www.glitch.com. It is super simple to set up, will never require a credit card, and is completely free. If you have access to a linux/mac machine, or don’t mind setting up a Node environment on Windows, I would recommend doing the challenges locally. There are several posts on the forum explaining how to do that. If you want a cloud environment similar to cloud9, you could check out https://codetasty.com/, I don’t know much about it, so I can’t recommend one way or another. 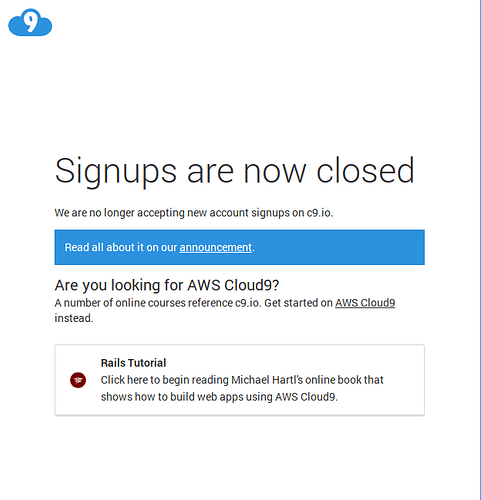 Yes, is necessary cc to continue with AWS, thanks to all for the supporting. If you don’t want to setup a local server (let’s say your computer runs Windows and you don’t wanna jump through hoops to get node working on it) you could always get a raspberry pi and setup a linux development on it, it’s not a free solution but its cheap and you only pay once. If you are looking for a Cloud IDE, you can also try PaizaCloud Cloud IDE .